The state of New Zealand's freshwater has become an urgent public issue in recent years. From across the political spectrum, concern is growing about the pollution of New Zealand's rivers and streams. We all know they need fixing. But how do we do it? In Mountains to Sea, leading ecologist Mike Joy teams up with thinkers from all walks of life to consider how we can solve New Zealand's freshwater crisis. 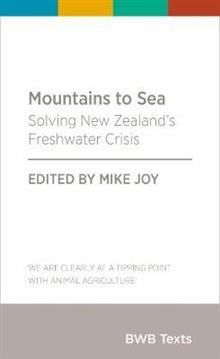 The book covers a wide range of topics, including food production, public health, economics and Maori narratives of water. Mountains to Sea offers new perspectives on this intractable problem. Mike Joy was a late starter in in academia - he first attended Massey University in his early thirties after working on farms, in the building trade and sailing the Pacific. Having gained a BSc, MSc (1st class hons) and a PhD in Ecology, in 2003 he became a lecturer in Ecology and Environmental Science at Massey Palmerston North, where he researched and taught freshwater ecology, ecological modelling, bioassessment and environmental science. Mike is now a Senior Researcher at the Institute for Governance and Policy Studies at Victoria University of Wellington, researching the interface between science and policy. Mike is an outspoken advocate for environmental protection in New Zealand and has received a number of awards including an Ecology in Action award from the NZ Ecological Society and an Old Blue award from Forest and Bird. In 2013 he received the Charles Fleming Award for Environmental Achievement from the Royal Society of New Zealand, in 2015 the inaugural Morgan Foundation River Voice Award, and in 2017 the inaugural NZ Universities Critic and Conscience award.